Programs identified in SVCE’s new Decarbonization Roadmap focus on transportation and building electrification, power supply, customer engagement and innovation. Board approved $6.02 million in funding for programs over a two-year period. Building on GHG reductions of 21% since 2015 baseline, goal is to achieve a 30% reduction by 2021, 40% by 2025 and 50% by 2030. 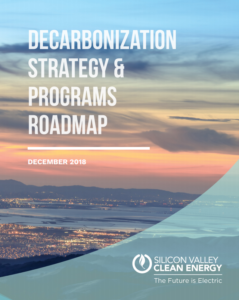 Sunnyvale, Calif. – The Silicon Valley Clean Energy (SVCE) Board of Directors adopted a Decarbonization Roadmap at its December 13 meeting that provides detailed initiatives to help local communities, businesses and individuals further reduce carbon emissions. SVCE was formed as a Community Choice Energy agency in March 2016 to serve 12 municipalities and Santa Clara County with clean power. Since that time, the public agency has delivered on its promise to supply carbon-free electricity at competitive rates. Clean electricity from SVCE’s carbon-free sources has contributed to a dramatic 21% reduction in area-wide carbon emissions from 2015 levels. The new roadmap sets ambitious goals to further reduce energy-related greenhouse gas emissions from 2015 baseline levels to 30% by 2021, 40% by 2025 and 50% by 2030. The roadmap presents ten specific strategies to achieve deep decarbonization and meet the goal of cutting carbon emissions in half by 2030. The strategies are focused on procuring and maintaining a sustainable, affordable and carbon-free power supply, electrifying buildings and transportation, promoting energy efficiency and successful grid integration, customer engagement and innovation. In addition to providing clean power, SVCE was founded by local governments to also reinvest in the community through local programs. Programs focused on all-electric building and design incentives, installing more electric vehicle charging infrastructure, as well as retrofits from gas to high-efficiency electric water heaters will provide jobs for area electricians, plumbers and others. The roadmap also leverages Silicon Valley’s robust cleantech startup ecosystem with an innovation platform to establish pilot opportunities. SVCE will engage with key strategic partners to prototype novel program ideas and help support innovation and new technologies that further accelerate decarbonization. Residential and business customers interested in becoming early adopters for the first set of programs, and companies interested in learning more about the innovation platform are encouraged to sign up for updates.